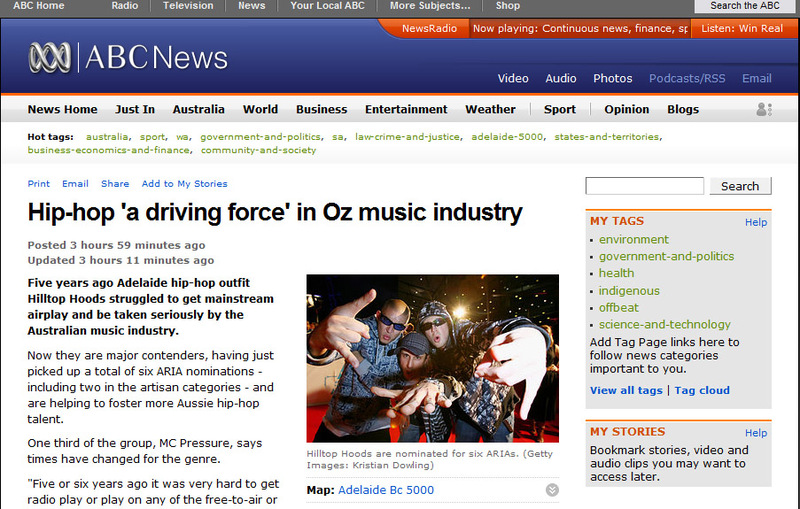 A lovely article over at ABC News was brought to my attention today, the article in question titled “Hip-hop ‘a driving force’ in Oz music industry“ is all about Australia’s favourite son’s of hip hop, the Hilltop Hoods and their six ARIA nominations. The interview goes on talking to Pressure and discussing the hoods but then throws in a doozie.. a picture of Bliss N Eso subtitled as “Hilltop Hoods are nominated for six ARIAS. (Getty Images: Kristian Dowling)” (which has now been removed 4 hours after it was published, however we have a screenshot below). Bliss N Eso - Now the Hilltop Hoods? Apparently someone at the ABC finds it a bit difficult to pick a picture of the hoods from a search for Hilltop Hoods on getty images, which returns a tonne of images we’ve all seen before but that are actually of the correct artists. How is it that an article (from a professional journalist) about how big hip hop is becoming in our country, manages to stuff it up so badly? Quite simply, they don’t care. 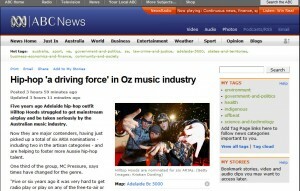 Some are going so far as to say this is yet another sign that hip hop in Australia still receives no respect as a viable artform from the Media and theres an element of truth to this debate, though i can’t help but feel the mistake could’ve easily been made with other artists outside of hip hop too. I’m gonna leave it at this, it’s really not that hard to find pictures of the any artist/band, google images returns tonnes as does getty images (the photos source) sure you can’t use most of the google results, but you can use them to verify that the image you’re putting up is actually the correct artist. If you’re going to try do a puff piece about how great something is, maybe do some research and get it right. Let us know your thoughts on this in our comments below. UPDATE: After taking the original image down, they’ve now replaced it with the same image, with a new caption and a new image actually of the Hilltop Hoods.